As Bitcoin proves on a daily basis, something is worth what someone will pay for it. But, for any negotiation on price and value, you need a starting point founded in reality. I’m writing this piece because our data shows that some food for thought might be welcome when it comes to figuring out what rate you’ll ask a company for. We looked at over 150 profiles of contractors who had provided both day rates and fixed term contract salary expectations when signing up with ContractElite. The results were interesting. 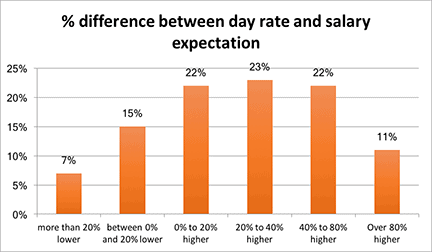 The chart shows how contractors have set their day rates relative to their fixed term salary expectations. 22% of contractors wanted a day rate lower than their salary expectations. A further 22% wanted a premium of between 1% and 20% even though they get zero benefits, holiday pay and sick payment being a contractor vs. being an employee. 11% of ambitious and optimistic contractors thought an 80%+ premium vs. employed status costs would be a reasonable ask to a company engaging them. You’re a contractor because you bring a depth of guaranteed skills and experience that often permanent employees do not have. That’s worth a premium. Most organisations spend huge sums of money on developing their employees. Most do not spend anything on developing contractors. Why? Because they assume you come “pre-developed” and that they are paying a contractor premium for this ready-made package. Only you’ll know what premium you personally command but it’s reasonable to suggest that you should. A rookie mistake to make but, in my first contract role, I forgot to factor in the number of days I would have as holiday (public and discretionary) or sickness. These days could easily add up to 35–40 days in a year that you’ll not get paid for if you don’t factor into your day rate. Also, you need to factor in down time between contracts. You’ll not always be able to guarantee a seamless move from one contract to the next, so be aware of this when you calculate your total number of likely days in a year you’ll work. Factoring this in could command c.15% additional on your day rate. Whilst all the above is (hopefully) logical, it’ll matter for little if you can’t demonstrate your value to a buyer that will have a view on what your day rate should be. The above will help justify your rate but you’ll have to get the buyer to want to buy first. Think about the specific value you are providing the company. Perhaps you have differentiating experience, skills or qualifications other don’t have. Perhaps you’ve delivered quantifiable results in a similar field that makes you more of a guaranteed bet. Whatever the edge you have, remember you do need an edge. You’re a services provider delivering outcomes and, in doing so, you need to sell the value of those outcomes. Remember, you’re an investment and if companies are going to pay a premium for their investments they need to know what they are getting in return. Mark Lee is the CEO and founder of ContractElite, a UK-focussed marketplace connecting contractors to companies seeking contractors. ContractElite provides a free-to-use platform for the UK’s professional contractors to advertise their services to buyers ranging from big corporates, SMEs and recruitment businesses. Mark’s career has seen him lead Korn Ferry’s RPO business across EMEA and Reed’s RPO business in the UK as well as advising numerous major recruitment businesses in an interim capacity. He is also currently a non-executive director at one of the UK’s fastest growing and innovative digital recruitment service providers. Should I get paid for a mandatory notice period? A well thought out piece covering all the major factors. Nice one. It would have been nice to see some sort of calculation and how the factors accumulate but I guess the danger with that might be people applying the calculation without thinking and/or commenting on the accuracy or otherwise of the calculation thus detracting from the piece.